Life is a funny old thing. We do change in small ways over time and our tastes develop too. During my early years in wine – 32 years ago now – the industry was much more prone to platitudes than it is now and wine knowledge was much more about generalisations and announcements from on high. Well, one of the things that the great and the good would say was that people develop a taste for red Burgundy and Pinot Noir as they get older. And wouldn’t you know that has happened to me. In all honesty it has been coming for a long time. For many years I have liked and appreciated Pinot Noir without loving it, while at some point over the last eight years I seem to have almost developed a passion for it. Unfortunately I do not have a Burgundy income, so I am always keen to find better value examples. 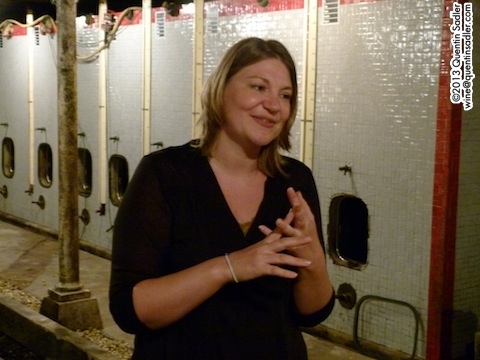 Wines that offer real Burgundy character, but at good price are relatively few and far between, so they must be cherished and recently I tasted a very good example and I was so pleased with it that I have made it my Wine of the Week. At least I know where I took the photo. Mercurey surrounded by vines. En Sazenay is just above the village on the far left on and forms the slope between the 2 groups of trees – if I remember correctly! Mercurey is one of the most famous wine villages of the Côte Chalonnaise, indeed the whole place is sometimes informally known as the Region de Mercuey and Mercurey is one of the most famous wines – I always like to remark that it is very user friendly as it is the only wine that if you spill it, you can pick it up with your fingers. The Côte Chalonnaise is sort of a continuation of the Côte de Beaune, in that it is mainly the same limestone soil. 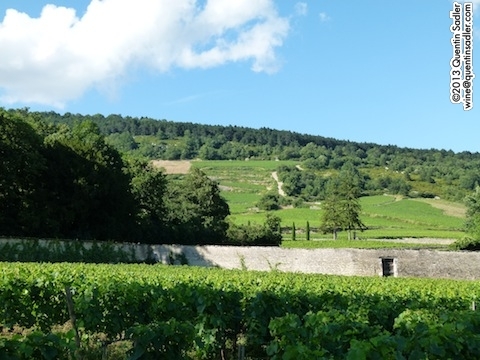 However, the En Sazenay vineyard – which is just to the south of the village – has heavier clay soils that produce a slightly richer style of wine. A bit like Santenay in the Côte de Beaune, you would swear you could smell the clay. 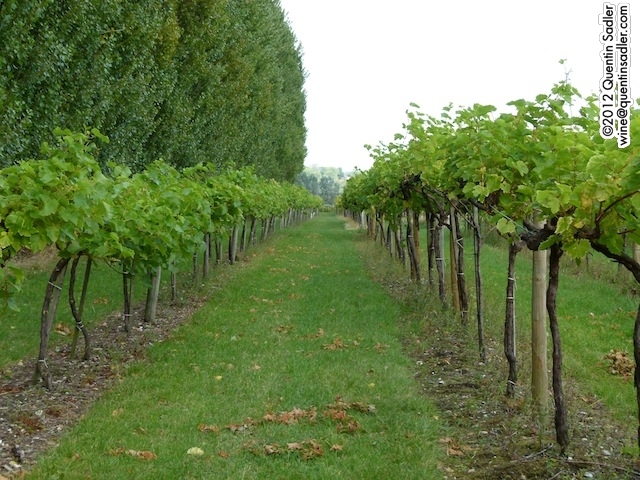 The vineyard is at 250-280 metres above sea level, a little higher than the village and faces south-east – which helps with ripening of course. 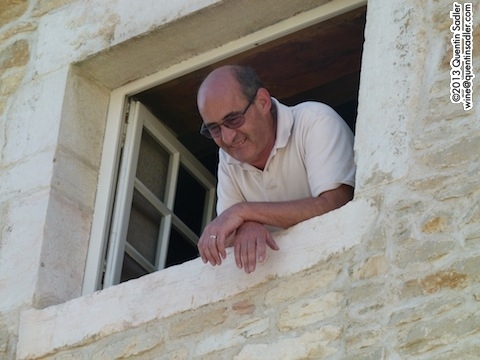 The domaine is run by Jean-Michel and his brother Laurent Pillot out of several small beautiful vaulted 13th and 17th century cellars. Their family have been making wine for generations and their expertise shows. As for winemaking they are very traditional, only using indigenous yeasts for the fermentation and ageing the wine for 18 months in oak barrels, only 25% of which are new as they want good integration of oak with the delicate characters of the Pinot. The nose is wonderfully redolent of undergrowth and fruits of the forest with a light touch of spice and coffee too. Utterly delicious with such Burgundian specialities as boeuf bourguignon and Coq au vin, but I enjoyed it with a rather fabulous steak and kidney pie. Available in the UK at £14.68 per bottle from 3D Wines – other buying options are available from 3D which make the wine even better value. Chablis town, you can see vineyards on the slopes beyond. Having just returned from a week in Chablis I am all fired up with enthusiasm for the place and its wines. Most wine drinkers will feel that they understand what Chablis is, a classic, crisp dry white wine, normally unoaked and made from Chardonnay. Well, as usual I discovered that most of what we believe to be true about the place is not true. 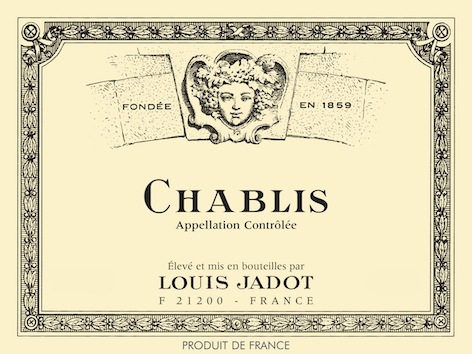 There are in fact may different styles of Chablis, many of them much richer than most consumers realise. However, I will write about Chablis another day and restrict myself to Chablis’s poor relation today – Petit-Chablis. In truth Petit-Chablis is no poor relation of Chablis, it is just a different wine. 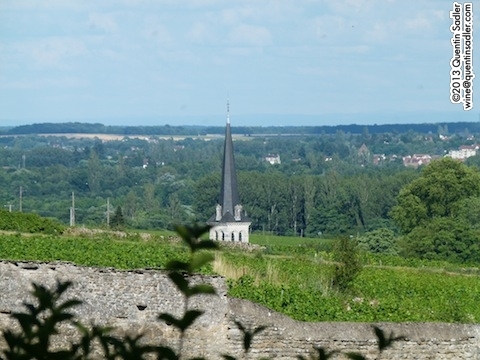 The wine of Chablis, wine that is given the appellation Chablis in line with the appellation contrôlée / PDO is named after this famous town, but defined by grape variety and the local soil. Chablis can only be made from Chardonnay vines and must be grown on the Kimmeridgian soils that are found on most of the slopes around Chablis. Kimmeridgian is named after Kimmeridge in Dorset and it is a calcareous clay and is a very fossil rich soil that contains the fossilised remains of ancient oysters and ammonites. The lime content of the fossils helps give acidity into the wine and, it is believed by some, to impart the typical minerality too. On the outskirts of Chablis, the Kimmeridgian soil is hard to find and makes way for the harder Portlandian soils that are not so rich in clay or fossils and generally produce wines that are less mineral, but more fruity. More importantly Portlandian soils are also found on the top of the Chablis slopes, the plateaux between the valleys, so is often right by some of the very best Chablis, Chablis Premier Cru and Chablis Grand Cru vineyards. The only wine produced on this Portlandian soil is Petit-Chablis. 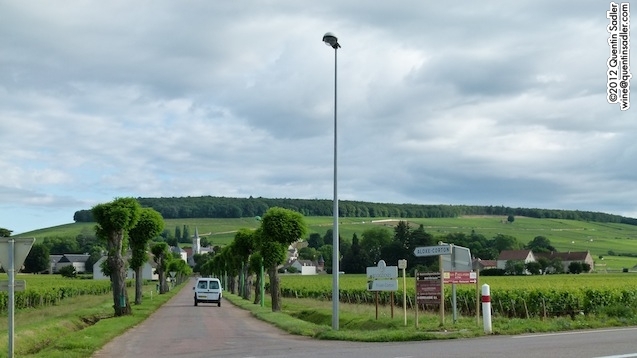 Chablis vineyards, looking North, the town is hidden in the valley. 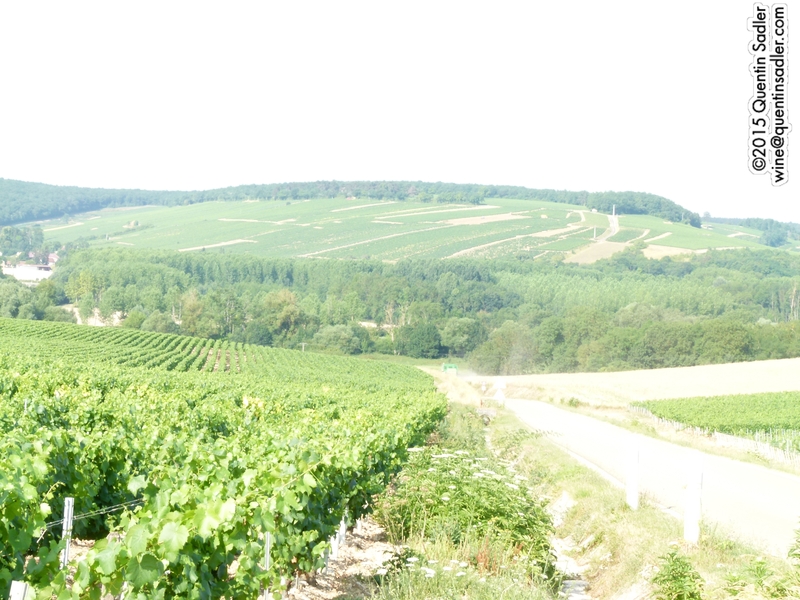 Some of the vines at the very top of the opposite slopes are Petit-Chablis. On the slopes it is Chablis Grand Cru. To many of us the name Petit-Chablis implies that the wine is somewhat lesser, although I understand that this is not so in French. With extensive tasting though, I discovered that this simply is not so. Although many of Petit-Chablis I tasted were pretty ordinary, others were far better than the dull generic Chablis wines that grace many of our supermarket shelves. 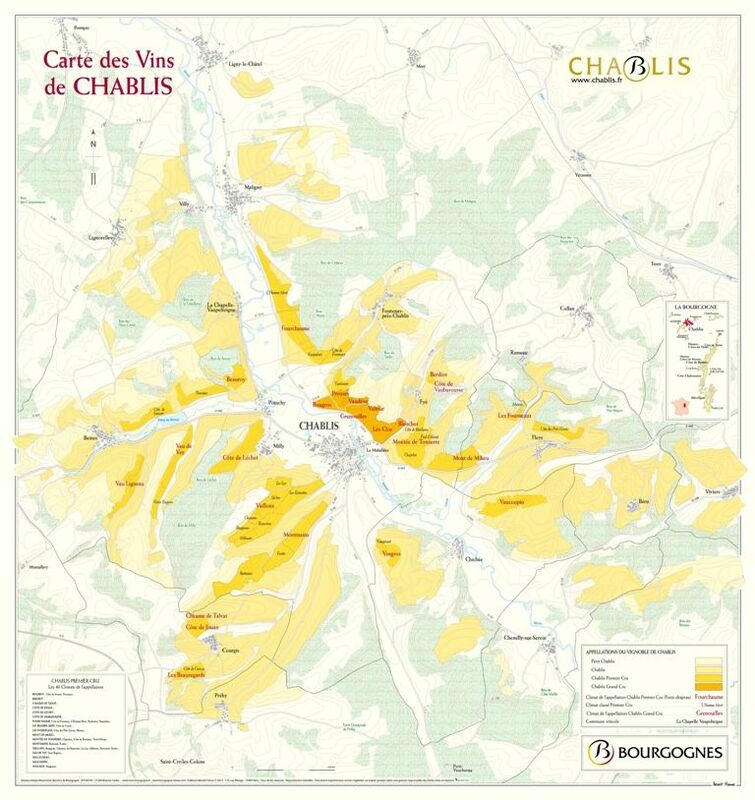 Wine map of Chablis, Petit-Chablis is in pale yellow. Frankly I was spoiled for choice as to which Petit-Chablis to write about today, Domaine Mosnier‘s was bright, focussed and very good, Domaine Moreau-Naudet‘s was richer and more mineral, La Chablisienne‘s Petit Chablis ‘Pas si Petit’ (not so little) is fresh with a touch of minerality. The Petit-Chablis from Jean-Paul & Benoît Droin is an extraordinarily fine wine, as is the one from Domaine Vincent Dauvissat. However as these last two are pretty pricey, although well worth it if you feel like treating yourself, so I have chosen a different producer’s Petit-Chablis to be my Wine of the Week – William Fèvre. 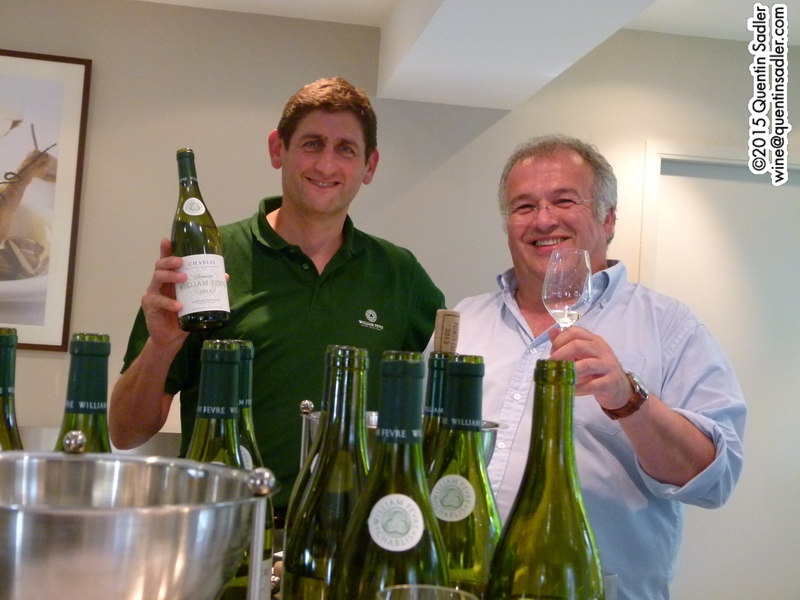 Didier Séguier (left) winemaker at William Fèvre. Alin Marcuello, hospitality manager is on the right. 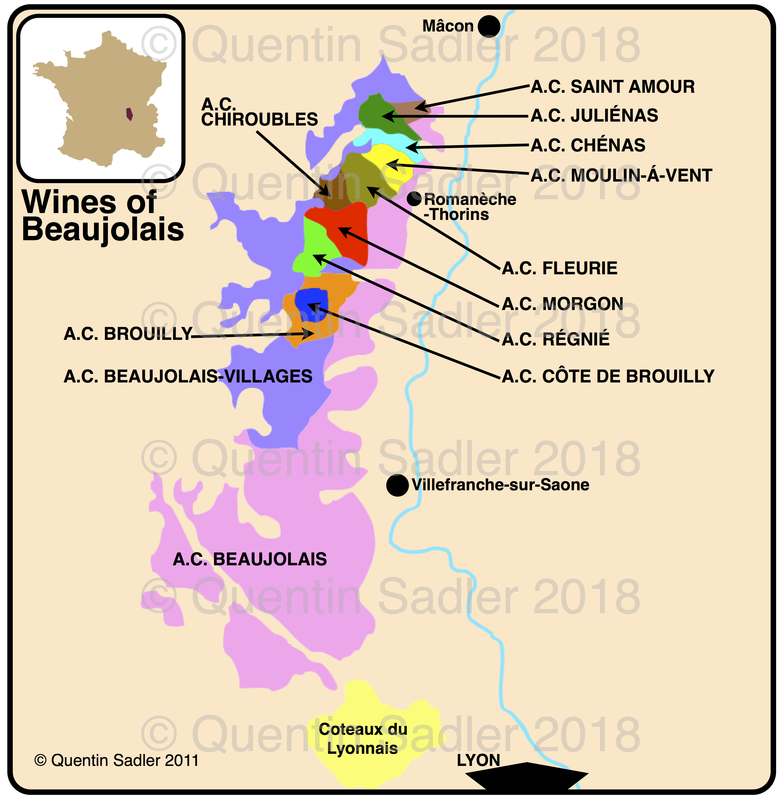 By the by, I often take the view that a top producer’s lesser wine, or appellation, is a better bet than a lesser example of a top wine, so think Gigondas rather than Châteauneuf, Coteaux du Giennois rather than Sancerre, Monbazillac rather than Sauternes, Côte de Castillon or Fronsac rather than St Emilion if you want good value. Unoaked Chardonnay with 10 months lees ageing in stainless steel tank. The colour is very pale, silvery and clear with a touch of green. The nose offers green apple, green apple skin together with some blossom and floral notes. The palate is surprisingly soft and round with appley and pear fruit. A steely, fresh quality balances the fruit with its lovely green acidity that is just off tart. This makes it a nice drinkable wine as the acidity is not too dominant, while little flourishes of chalky and seashore minerality add complexity and finesse. It has a lovely long finish. The 2013 is currently available and is a little richer and rounder. The 2014 will be available around October / November 2015. 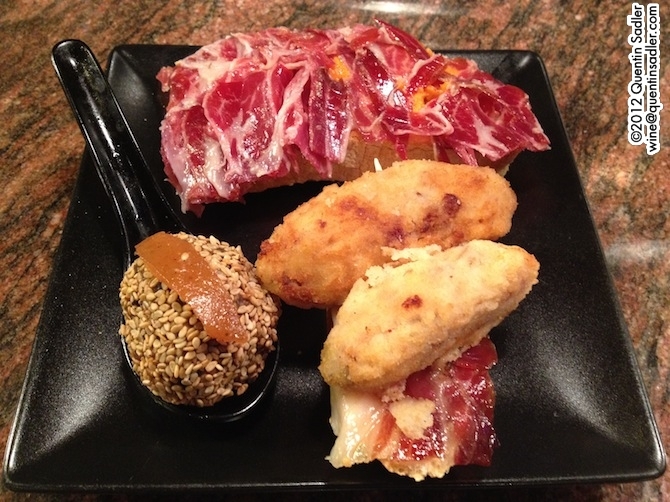 This makes a perfect aperitif, or serve it with soft cheese, shellfish, grilled fish and white meat. For UK stockists look here and contact Fells and Co. If you are after a white wine with weight, succulence or viscosity as well as elegance and freshness, then white Burgundy might well be the style for you. Certainly no where else quite gets that balance between richness and acidity so right. The only problem is that most good white Burgundy nowadays is eye waveringly expensive, so I am always on the look out for great value examples. Not long ago I was fortunate enough to taste a white Burgundy that I found really exciting and that did not overstretch the budget too much, so I made it my Wine of the Week. Burgundy of course is one of the really great wine regions in the world, right up there with Bordeaux and Champagne. 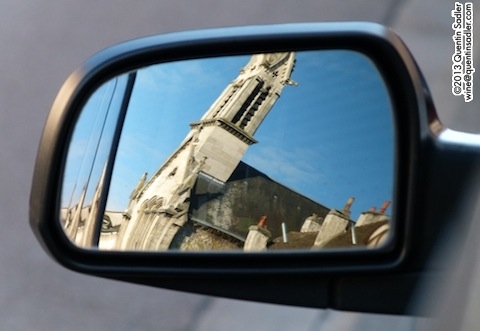 To wine beginners Burgundy – or Bourgogne to give it its proper French name – can appear very complicated and unsettling. There appears to be a lot to learn and I can well understand that many people give up and return to wines whose labels and names seem easier to understand. However, it is worth persevering as the wines of Burgundy can be sublime. Vineyards around the southern Côte de Nuits. 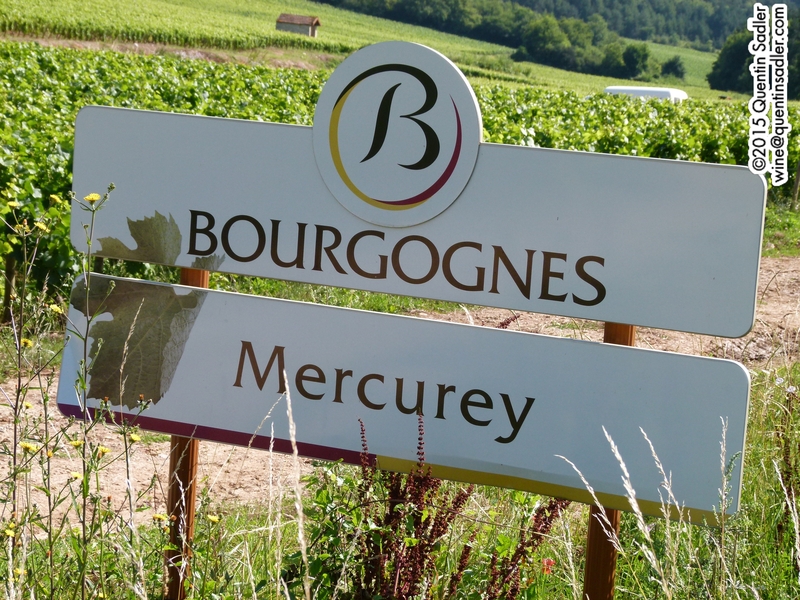 The names on the labels are simply the place where the grape is from, some come from anywhere with the region and are labelled as Bourgogne, while others come from a specific district – such as Mâcon – or from a particular village – such as Meursault. If you are interested you could do worse than read my piece all about Burgundy by clicking here. 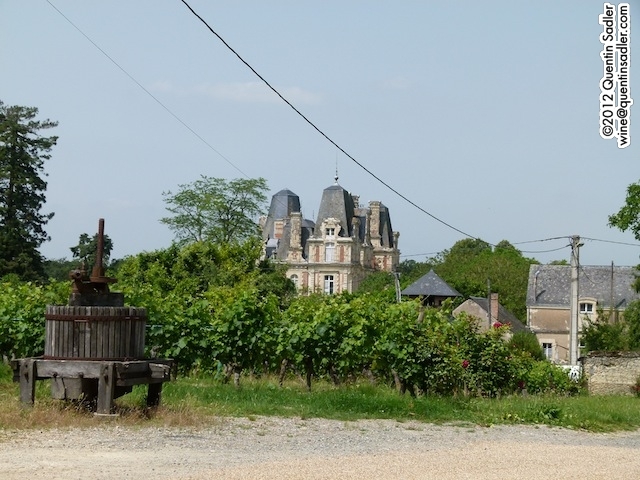 This tidy little estate really captures the spirit of French wine to perfection. Family owned and family run since 1899, the Désertaux family tend most of their wines around their winery in the sleepy village of Corgoloin. 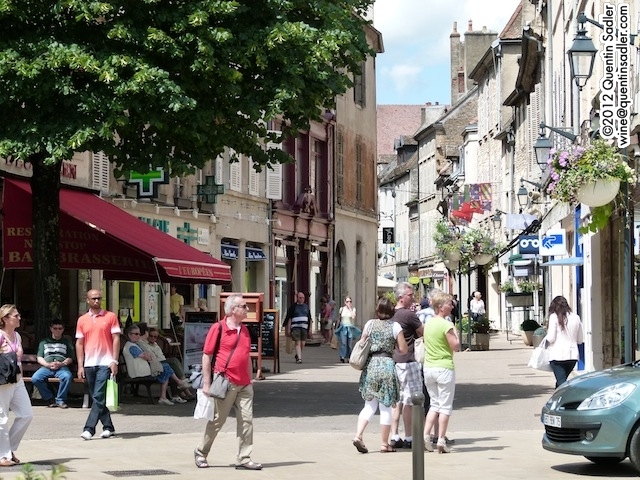 This is right on the border between the Côte de Nuits and Côte de Beaune and, like nearby Comblanchien, it has no appellation of its own, but instead sells the wines as Côtes de Nuits-Villages. 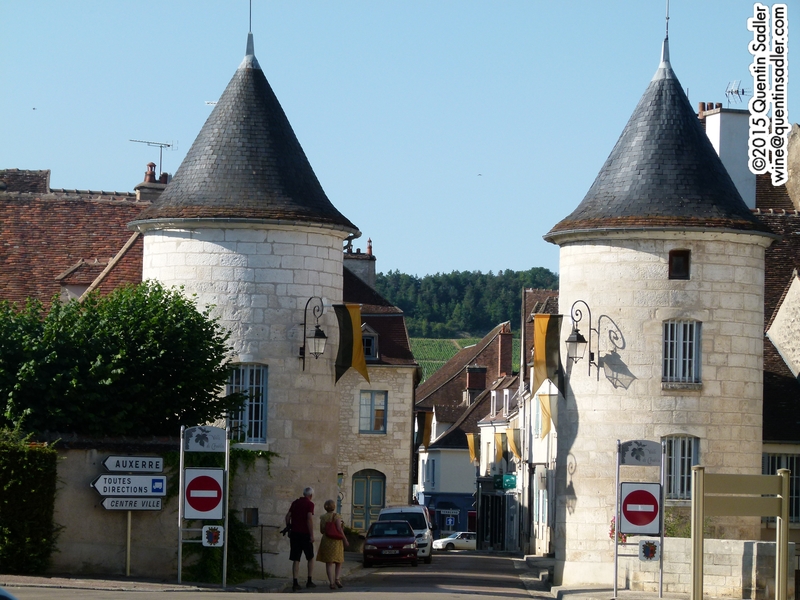 The Côte de Nuits is overwhelmingly red wine territory and white Côte de Nuits-Villages are rare, indeed the Désertaux family were the first people to actually sell one. The estate was founded in 1899, but sold their wines to a negociant until 1965, so the label did not exist before that date. Until recently they just farmed the 12 hectares around the winery, but have added to that in recent years with parcels in Beaune 1er Cru, Pommard, Meursault 1er Cru and Ladoix. The family also have some charming gîtes, so think of them the next time you are looking for somewhere to stay in Burgundy. We are so often lazily told that all white Burgundy is made from Chardonnay that many people are astonished to discover that actually a fair amount of the wines also contain some Pinot Blanc – and even sometimes some Pinot Gris (or Pinot Beurot as it is known locally). That is exactly the case here though, 20% old vine Pinot Blanc lends a succulence to this wine that it would otherwise lack, while the 80% Chardonnay supplies the backbone of acidity and minerality. One third of the wine was barrel fermented and briefly aged in in new oak barrels, the rest had a cold fermentation in stainless shell tanks. Everything about this wine works nicely. The aromas are very gently nutty and creamy together with a dash of citrus. The palate has a touch of seductive richness, some light cream, nuts and vanilla, while the texture is succulent and really caresses your palate. There is plenty of fruit too, white peach, nectarine and melon vie with each other, while the acidity has a touch of lemon about it as well as a little apricot zing. The freshness of acidity and minerality (read my piece about minerality here) keeps the wine focussed, pure and refreshing. The finish is long and elegant and the balance between richness and freshness is very good indeed – 88 points. I think this wine is a terrific white Burgundy and would serve it with some classy fish, grilled sole if I could, or a fish pie perhaps. It would also work well with pork or chicken and would be an excellent partner to softish cheeses. Available in the UK for around £14 a bottle from 3D Wines. Available in the US for around $25 a bottle from K&L Wines. Recently I was invited over to Burgundy as the guest of a campaign called Discover the Origin whose job is to promote traditional European products that have a clearly defined place of origin – Burgundy is a classic example. 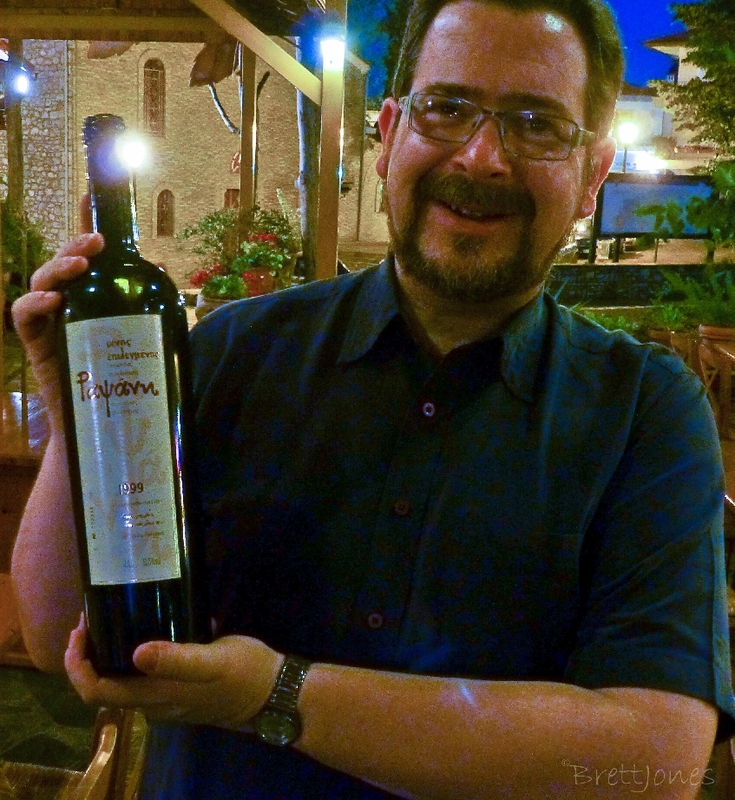 It was a wonderful trip and gave me a realinsight into this incredible wine region. 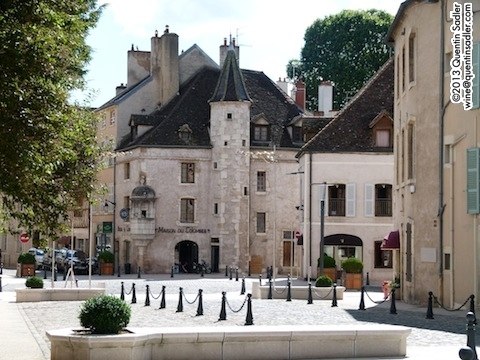 Beaune, Burgundy’s main town, is a delightful place to explore. 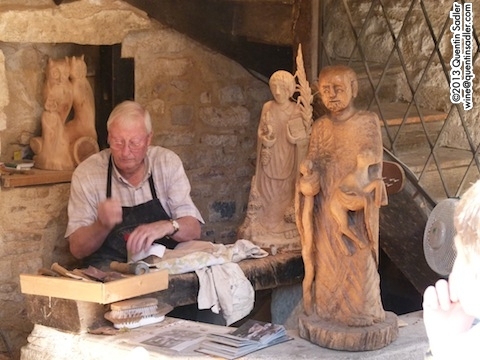 All those medieval building still need looking after, so the old skills still exist here. Many of my students find the sheer variety of Burgundy wines intimidating and the array of labels bewildering, which is presumably why some of the easier to understand examples are the best sellers. I agree that at first glance Burgundy can look complicated, but actually it isn’t hard once you strip it down to basics and learn to trust Burgundy rather than fight it. 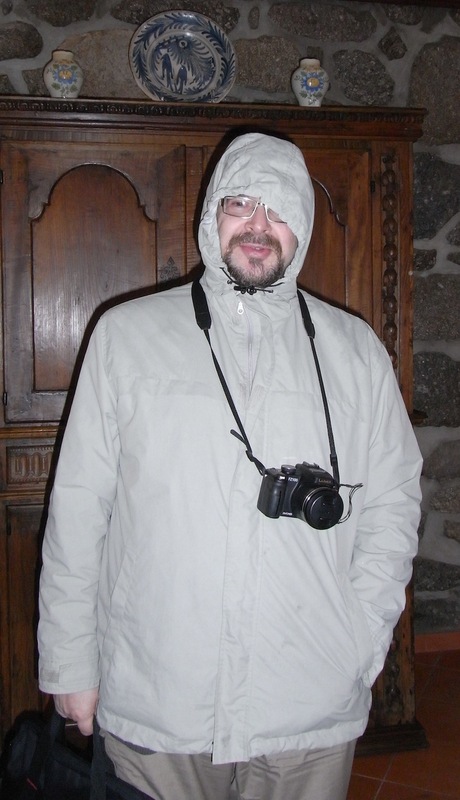 Of course that does depend on how much you really want to get to grips with the place and its wines. Becoming a world authority on Burgundy will be fiendishly difficult, but the good thing is that no one really needs to understand everything about it. Most of us just need enough information to enable us to enjoy the stuff without worrying too much about the potential pitfalls. 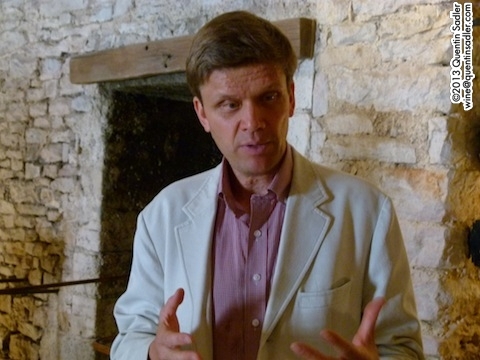 Here is my best advice to those of you who would like to get to grips with Burgundy, but find the complications off-putting – oh and if you do know about Burgundy, look away now, this is for the many interested, but nervous wannabe-Burgundy drinkers I meet. Please remember to click on all the links. The basic thing to get to grips with, perhaps more than any other wine region, is the geography. The wines are not big, rich and fruity, but dry and savoury because they come from somewhere cold with short summers. The fundamental dimensions and weight of most of the wines are similar as you would expect given that almost all the white wines are made from Chardonnay and the reds from Pinot Noir – both these grapes originate here. The winemaking is pretty similar too and the grapes are grown over a relatively small area, so the climate does not change much and variations are subtle. Every time I taste a lot of Burgundy I find myself writing many of the same words. I know the wines are different, but those differences are so subtle that they are very hard to sum up in a simple way. 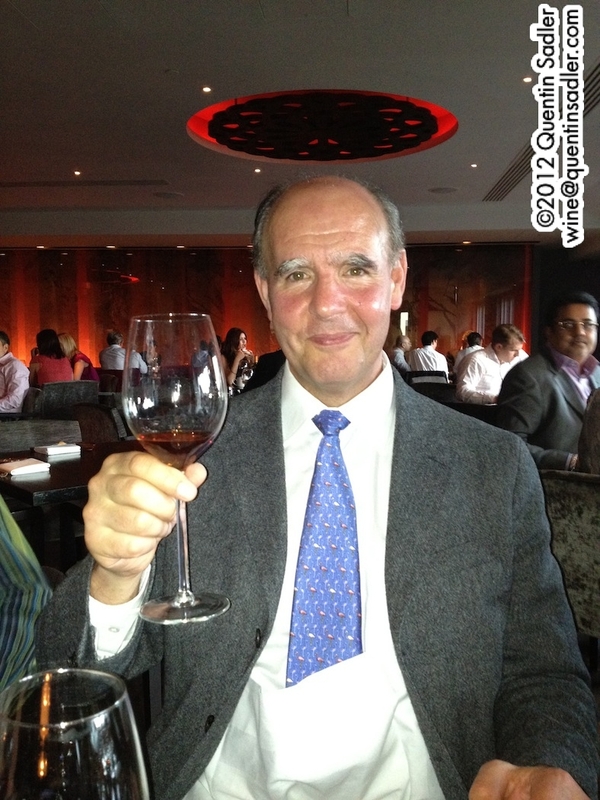 Frédéric Drouhin, urbane and charming director of Maison Joseph Drouhin which was started by his grandfather. 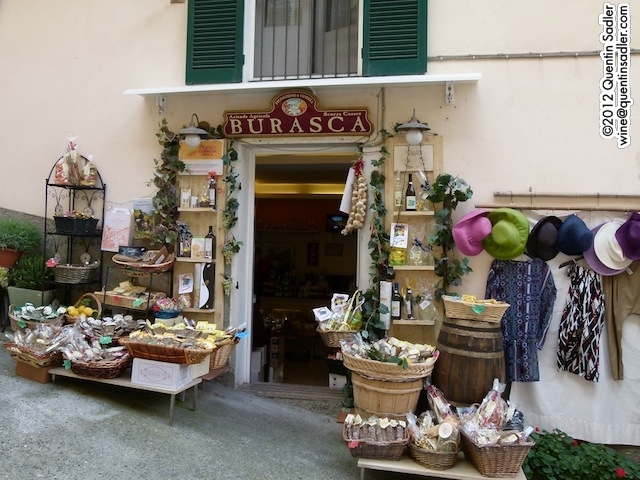 The visit here was delightful and the wines had all the elegance you would expect. 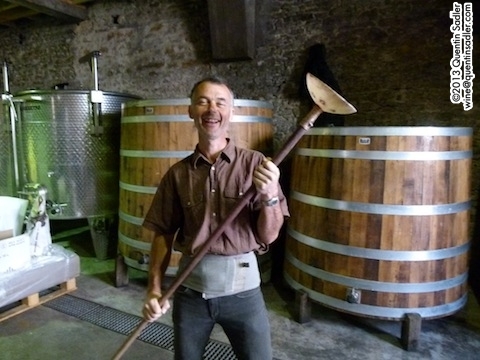 En garde – the delightful Alain Hasard with his pigeage plunger. Note the small scale of the vats at his wonderful little domaine Les Champs de l’Abbaye. 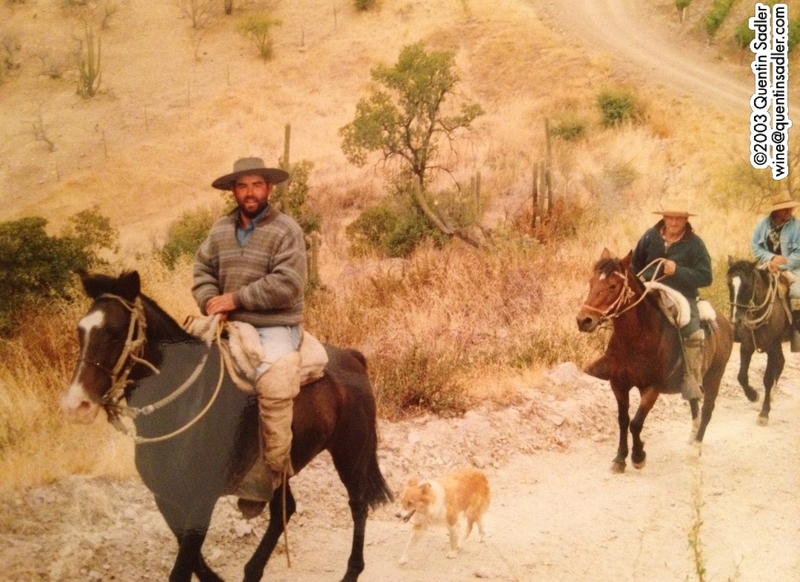 All his viticulture is organic and indeed biodynamic inspired – I liked him and his wines. 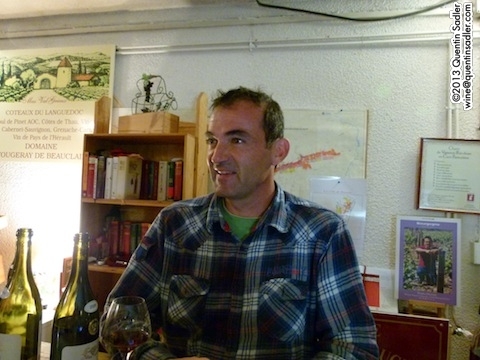 Jean-François Chapelle of Domaine Chapelle in Santenay – his wines are superb too. Marion Javiller of Domaine Patrick Javiller. They made 2 of my favourite wines from the trip and rather wonderfully I could (almost) afford them too – 2010 Bourgogne Blanc Cuveé Oligocène and their wonderfully silky 2010 Savigny-les-Beaune 1er Cru Les Serpentières. 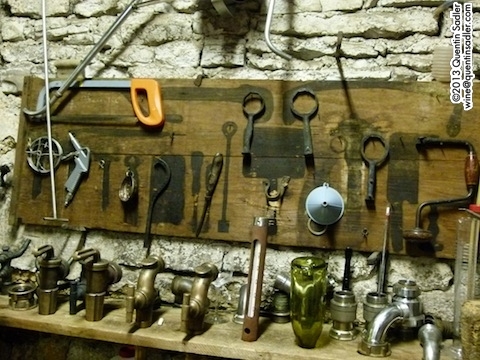 The tool rack at Domaine Joseph Voillot, note the Tastevin. I loved their Volnay wines, especially the sumptuous, yet mineral 2010 Volnay 1er Cru Les Caillerets. 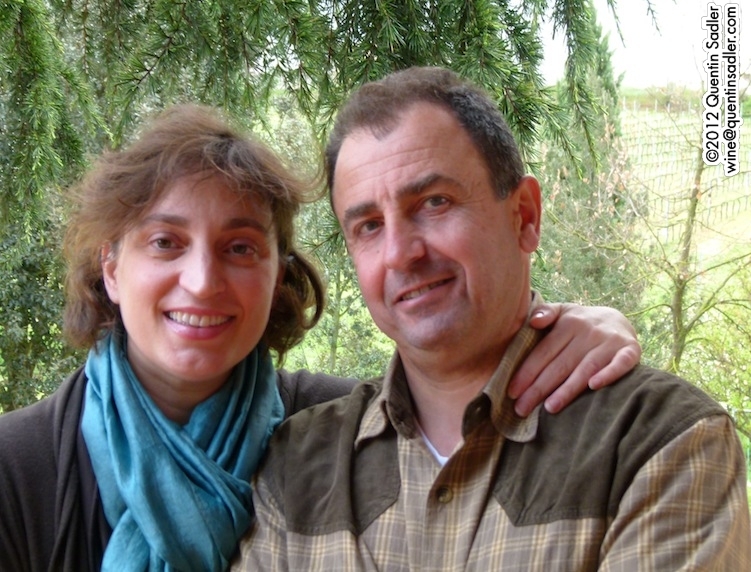 Patrice Olliver of Domaine Fougeray de Beauclair in Marsannay. Amongst many other lovely wines he makes an intriguing and rather good white Marsannay from 100% Pinot Beurot which is the local name for Pinot Blanc. Remember that Burgundy is a deeply traditional wine region where most of the producers are really just small family owned farms. 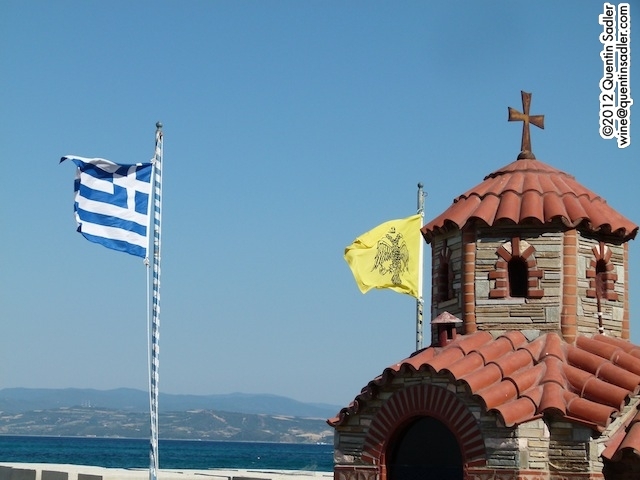 This is not a place of big brands and industrial sized wineries and this traditional outlook shows in the wines, probably more than any other place in the world today. These wines are made by people who passionately believe this is the best place on earth to make wines and that the wines of their region are the best in the world. As a consequence the idea of a wine being bright, bold and very fruity is almost an impossible concept for a traditional Burgundian to understand. Therefore expect elegance not weight, delicacy not power and the wines to be fundamentally savoury rather than sweetly fruity. As a consequence Burgundy wines really are best suited to being drunk with food. Most Burgundians would never think to drink a glass of wine on its own, that is what a Kir or Kir Royale is for. Wine, Burgundy wine anyway, accompanies food. Something else that is a little different here. 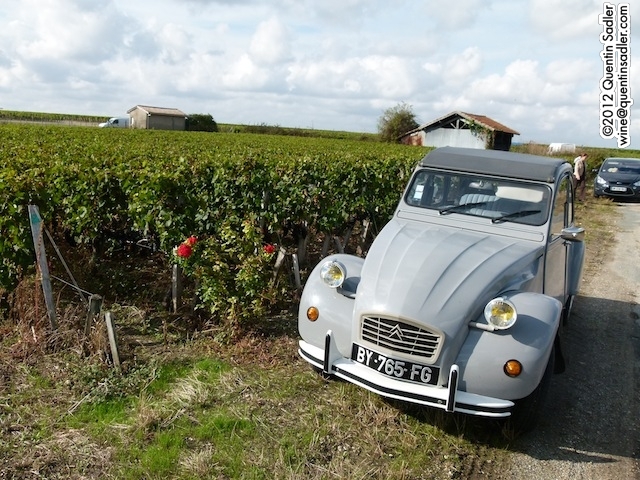 Very few vineyards in Burgundy have just one owner. 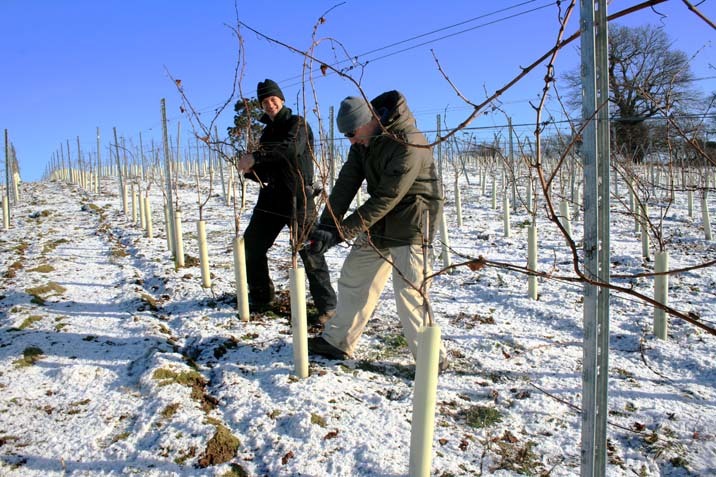 Usually a single vineyard site is owned by several different growers and producers all making their own version of the wine. That is why a wine that appears to come from a specific vineyard often has many different labels. That is why wines that perhaps ought to be the same can sometimes taste more varied. If there is a single owner of a specific vineyard it will usually say ‘monopole‘ on the label to show it is that grower’s monopoly. To enjoy and appreciate Burgundy you need to either be vaguely aware of the geography or at least choose to accept it or find it interesting rather than intimidating. All the important information on the labels is geographical, it’s all just place names, the region, district names, village names or vineyard names. Personally I find it useful to embrace the unknown on a wine label – if you have never heard of the place or grape on a label, try it. What is the worst that can happen? 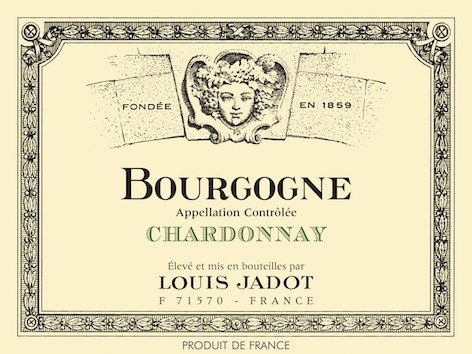 A good quality Bourgogne from a famous producer – this one informs us that it made from Chardonnay, most Burgundy labels do not mention grape variety. The more basic wines from Burgundy are labelled as Bourgogne, which is French for Burgundy and is the catch all appellation for the whole region. 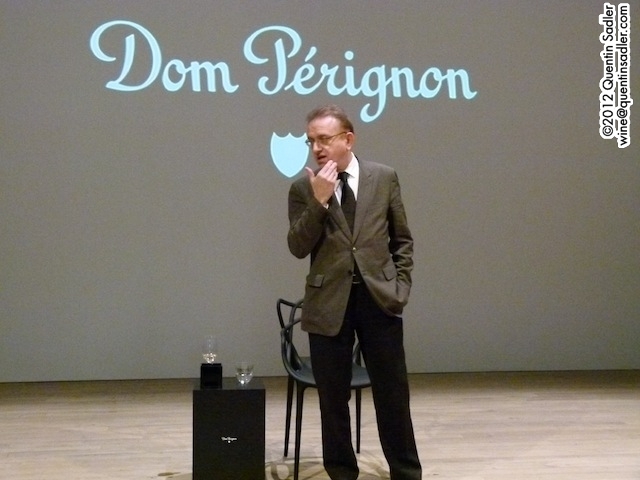 Bourgogne is an appellation d’origine contrôlée (AOC or AC), which is a system of guaranteeing provenance to the consumer. Similar controls are found throughout the EU – and beyond – to regulate traditional products like ham, cheese and spirits, but wine is the most famous. 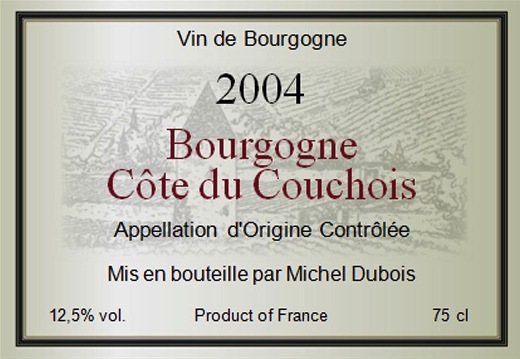 Some seemingly humble Bourgogne wines are very good and will give you an idea of the fundamental style of the region. 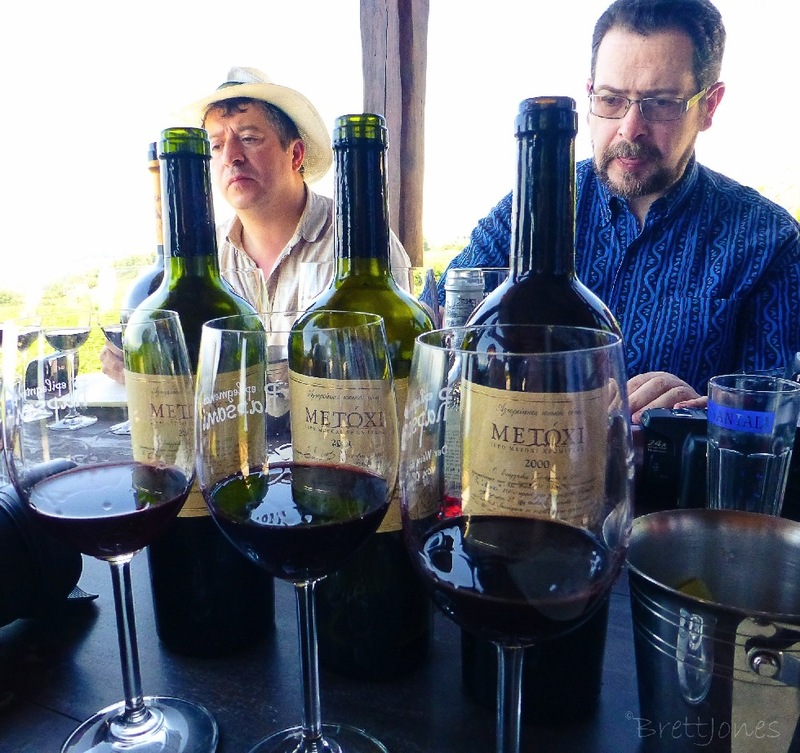 These wines tend to be the more affordable ones – but that is not always the case and knowing the exceptions is where your hard won experience will eventually count. The district names of Burgundy appear on many labels as a more specific place of origin than Bourgogne. These show that the wines comes from a distinct part of the region, rather than the region as a whole. Chablis and Mâcon are districts, as are Bourgogne followed by the name of an area, such as Bourgogne Côte Chalonnaise, Bourgogne Côtes-du-Couchois, Bourgogne Côtes d’Auxerre or Bourgogne Hautes-Côtes-de-Beaune. No one knows them all, well I don’t anyway, but once you understand the principle this sort of labelling is quite straightforward. After a while you will start to notice the subtle differences in how these various wines taste. 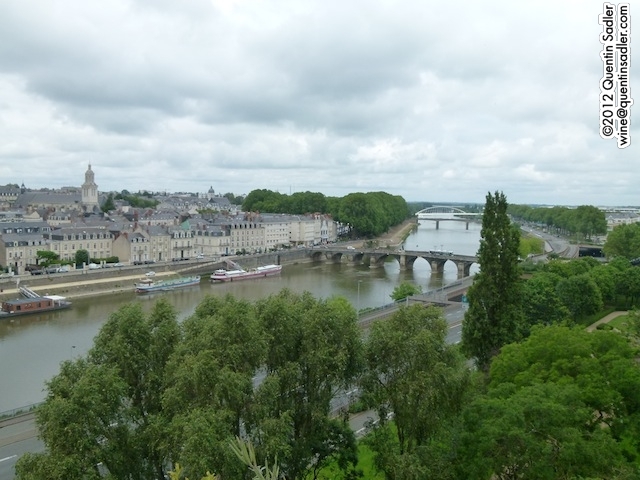 For instance the wines of Mâcon are clearly softer, fruitier and taste as though they come from somewhere warmer than the cold northerly slopes of Chablis. While Chablis wines are more mineral, taut and crisp than a Mâcon – the cool climate shows in the wine. 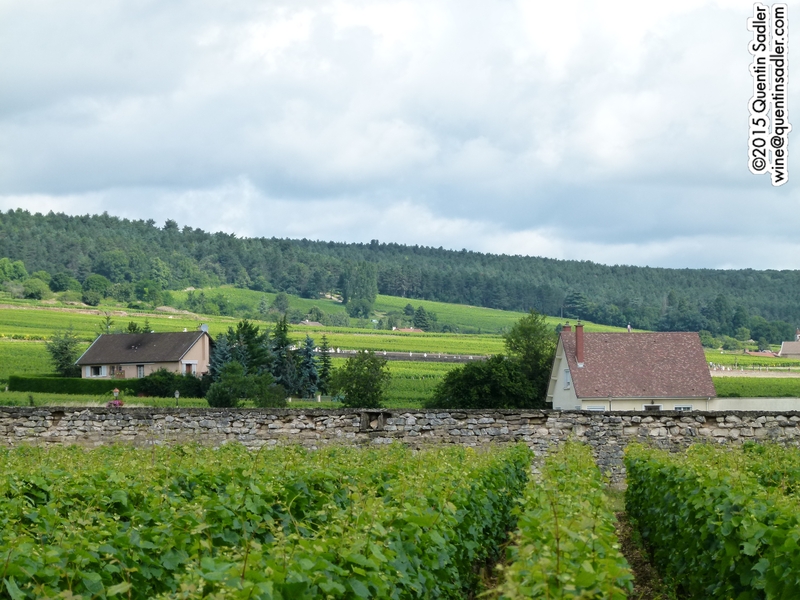 Quality in Burgundy is supposed to be all about the vineyard site – remember those subtle variations – so in the quest for quality it is always good to know where your grapes were grown. Therefore the benchmark for Burgundy is the wines that have the name of a village on their label. The grapes that the wine is made from were grown in vineyards that surround that particular village, so we know where the wine originates. Meursault, Beaune, Nuits-St-Georges, Puligny-Montrachet, Mercurey and Givry are examples of these village wines. You have to remember that grapes have been grown and wine has been made in Burgundy for hundreds and hundreds of years. Over that time certain places have come to be regarded as having the inherent ability to produce better wine than others. 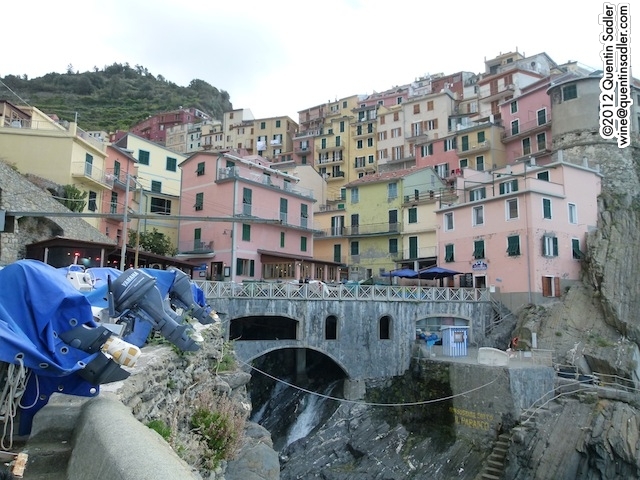 This accounts for why some villages are so famous. 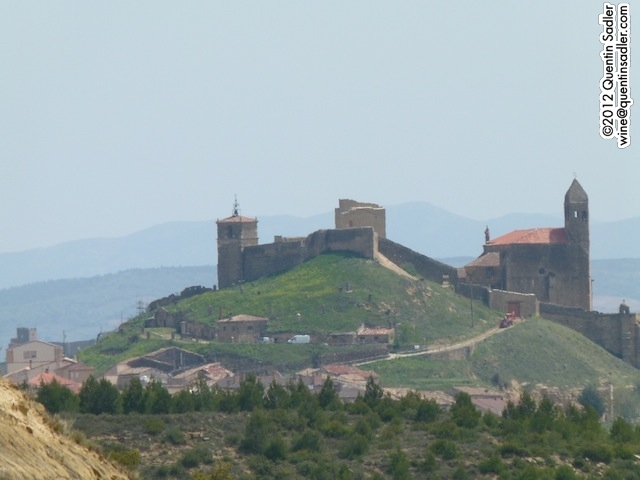 Some specific vineyard sites within the villages can also be thought of as producing better wines than others, or at least to be capable of producing better wines. To celebrate and affirm the potential quality of these vineyard sites many have been awarded Premier Cru /1er Cru status and if the fruit all comes from a single 1er Cru vineyard the name of that site will appear on the label together with the village name. 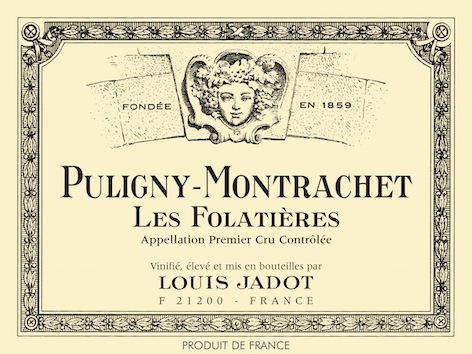 This white also comes from Puligny-Montrachet, but more specifically the 1er Cru site called Les Folatières. The very pinnacle of Burgundy production though is the Grand Cru vineyard sites. 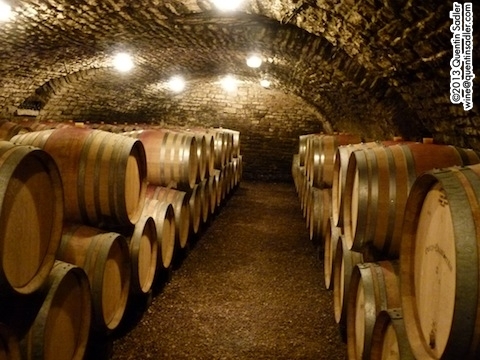 These are places that are thought to be capable of producing the very finest and most concentrated Burgundy wines of all – there are not many of them and they do not produce much wine at all, so are often eye-wateringly expensive. 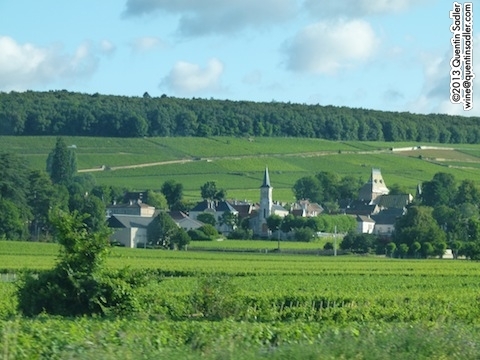 The Montrachet vineyard is shared between the villages of Puligny and Chassagne and has been added to the name of both villages. So many UK wine drinkers brought up on wines labelled by grape variety seem to want to rant, rail and kick against the traditional French way of doing things. It makes life much easier to just accept it, pay attention to the information on the label that is useful to you and ignore the rest. I always warn my students to never go looking for consistency or logic in French wine regulations as they often mean subtly different things from region to region even when they use the same words. On my trip I visited a wide range of producers, from big names with grand cellars and lots of employees to tiny, hands on vigneron who scratch a living from a tiny patch of vines. All were passionate about Burgundy though. 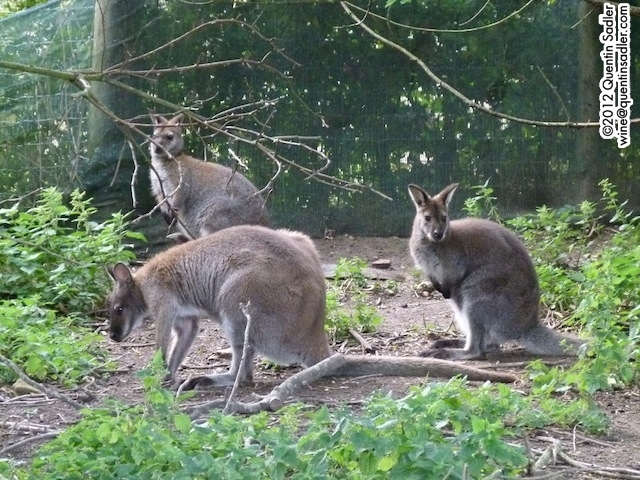 They all loved their land and thought the site mattered. None of them in their hearts believed they were producing Pinot Noir or Chardonnay wines. They were merely using those grapes to express the character of the land they farmed – they were bottling Meursault, Volnay, Savigny-les-Beaune, Mercurey or Montagny. Their wines were capturing and celebrating the subtle differences and variations that make each of these wines unique. It is precisely these differences that make Burgundy so interesting and worthwhile to the wine enthusiast and over time the very real, but subtle variations between wines from the Côte de Nuits, Côte de Beaune and the Côte Chalonnaise become apparent. The beautiful cellars of Domaine Heresztyn who make lovely wines in Gevrey-Chambertin. What makes the differences is best shown by using the Côte d’Or as my illustration. 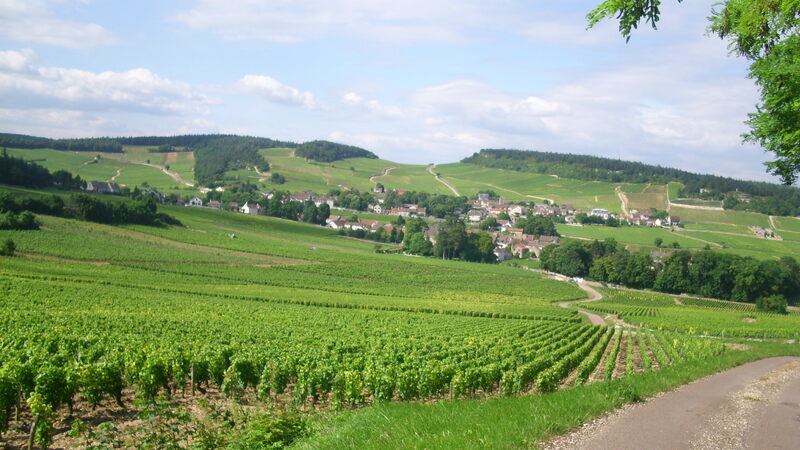 This part of Burgundy is the most celebrated and contains most of the really famous wine villages of the region. Of the truly renowned Burgundy areas and villages, only Pouilly-Fuissé and Chablis are not found in the Côte d’Or. At first glance the Côte d’Or, made up of the Côte de Beaune and the Côte de Nuits, would appear to be so small that the wines it makes must surely all be pretty similar – after all it is sometimes less than half a kilometre wide. However, this is the place that really demonstrates the French concept of ‘terroir‘. The soils and conditions really matter here and make for the differences between the wines, although nuances might be a better word than differences as they are slight. 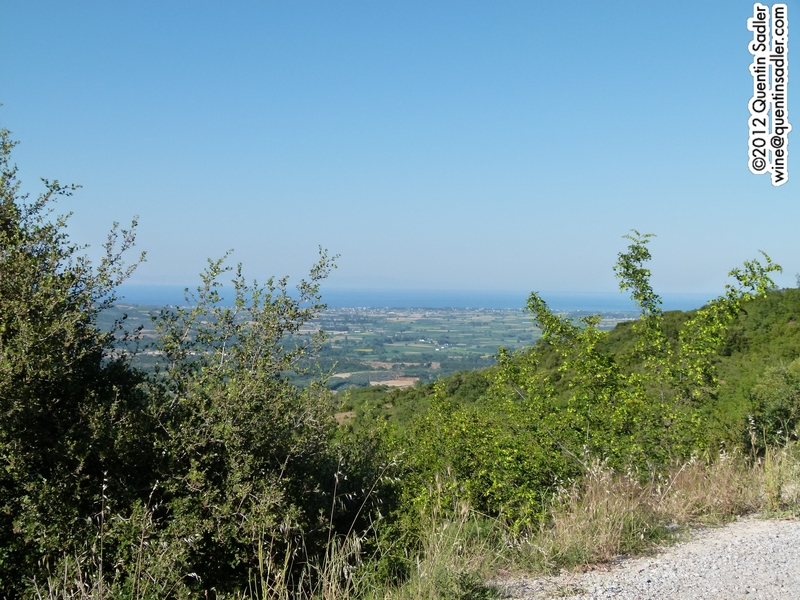 The limestone ridge or escarpment that is the Côte d’Or consists of layers of different limestones, some more porous than others, as well as marls made up of clay, sand and gravel. 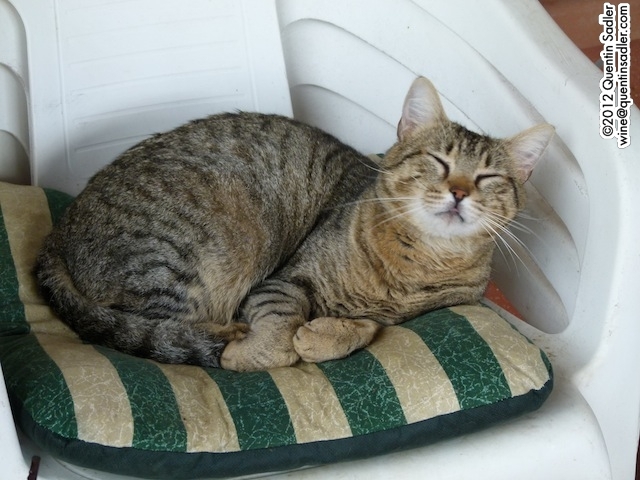 That makes sit sound as though it is all uniform, but it really isn’t. The limestones have weathered and decomposed at different speeds and are pierced by small rivers and dry valleys making for great variation as to which limestones dominate different parts. The topsoil also varies, as some are flinty and some a more chalky scree and the collapsing of the limestone ridge leaves different types and depths of topsoil. Another variable is aspect, there are fissures, gaps, ravines and valleys in the limestone which change the direction a little, so some vineyards face more directly south than others – these will generally produce bigger wines as the grapes get more sun and so have more sugar which produces more alcohol and extract in the finished wine. Luckily for us we don’t have to learn what the soil composition is of each and every village, let alone vineyard site, which is good because there is a great deal of overlap and variation making it very difficult to generalise to any useful degree. No, we only have to try the wines and see which ones we particularly enjoy. So the next time you fancy some good charcuterie, try a red Burgundy with it, or it would be perfect with Boeuf Bourguignon or Coq au Vin too, those wonderful classic dishes of the region. White Burgundy really comes into its own with soft, squidgy cheeses or a simply cooked piece of fish. If you really want to open your eyes to Burgundy though I would really recommend visiting the place for yourself, there is so much to see and enjoy. At their best the wines of Burgundy are without peer, but the region produces such a relatively small amount of wine with high world demand that they can be very expensive indeed and even then can frequently disappoint. When they are good though they really let you know it. It is interesting that the wines of Burgundy do get to you over time. I well remember that twenty odd years ago their beguiling beauty passed me by. Not any more. As good as many others are, no where on earth uses Chardonnay to make such exquisitely poised and balanced white wines with tension between the richness and freshness. 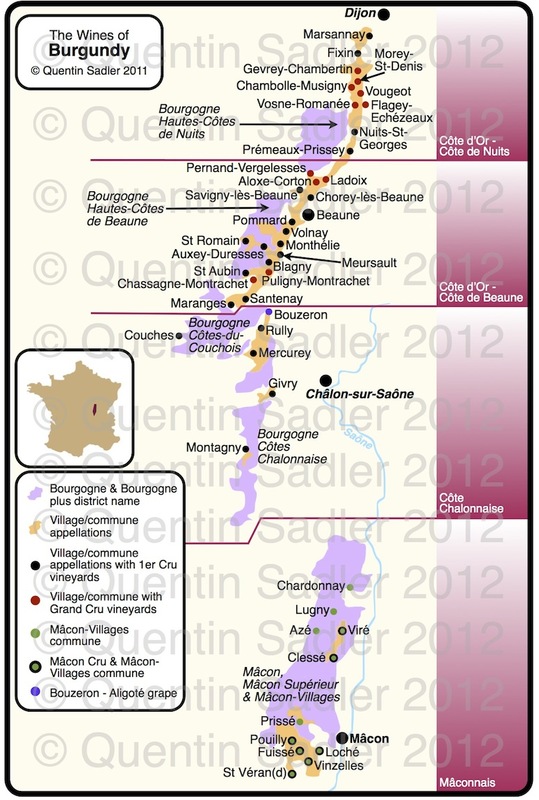 The red wines of Burgundy though are more tricky to get your head around. I think this is because they defy the wine norms of our time. We are used to big wines, full-bodied wines are widely favoured over other styles, yet Pinot Noir grown in the coolish climate of Burgundy simply does not produce truly full-bodied wines. They are generally lighter and more savoury than most other famous types of red wines and I think they really do need food to show at their best. I have been fortunate to visit Burgundy a good few times over the years and am slowly acquiring a good working knowledge of the place and its wines. 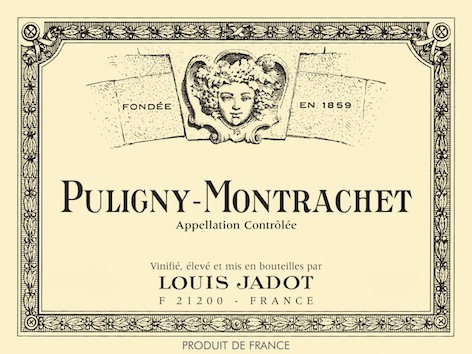 In addition I have been involved with Louis Jadot, one of the great producers of Burgundy on and off for some 25 years. In a region which is usually a patchwork of very small vineyards and producers it is very hard to get an overview of the place from this array of tiny farmer-winemakers. 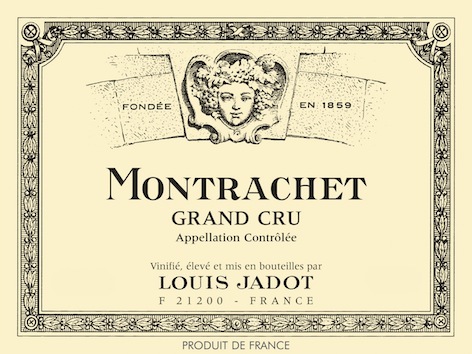 So a producer like Louis Jadot who is the largest landowner in the Côte d’Or really serves a useful purpose in providing a wide range of Burgundy wines. There are other famous districts of Burgundy, Chablis, Mercurey and Pouilly-Fuissé amongst them, but it is really the Côte d’Or that sets the tone and provides much of the region’s fame. It is home to some of the most famous and sought after wines in the world including Meursault, Pommard, Gevrey-Chambertin and Nuits-St-Georges. At first glance the Côte d’Or would appear to be so small that the wines it makes must surely all be pretty similar – after all it is sometimes less than half a kilometre wide. However, this is the place that really demonstrates the French concept of ‘terroir‘. The soils and conditions really matter here and make for the differences between the wines, although nuances might be a better word than differences as they are slight. The limestone ridge or escarpment that is the Côte d’Or consists of layers of different limestones, some more porous than others, as well as marls made up of clay, sand and gravel. 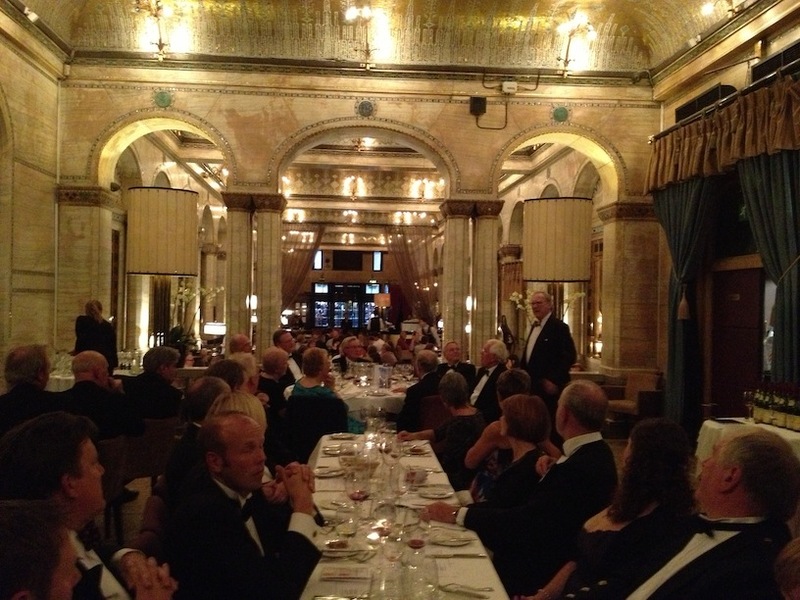 The other day I was asked to put on a fine red Burgundy tasting in The Criterion Restaurant in London’s Piccadilly. I had never been there before and what a place it is. Founded in 1874 hard by the Eros statue in Piccadilly Circus the restaurant is a sumptuous confection of such exuberance that to my uneducated eye seems a heady combination fin de Siècle and art nouveau styles. The shiny gold mosaic tiles made me feel I was inside a Klimt painting and the general ambience made it seem possible that Oscar and Bosie would walk through the door at any moment.